It’s been a tough second week, I will not lie. Jill and I have been weeding, digging, raking, mowing and mowing. 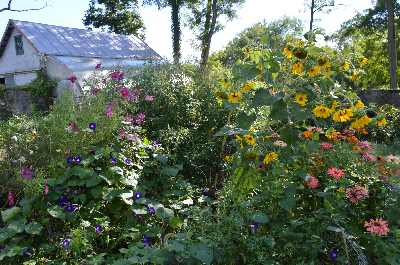 It’s one thing to let a farm go “natural”; it’s a very different thing to let it go wild. 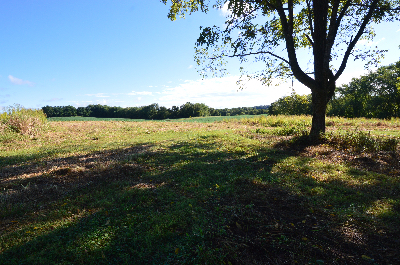 We’re seeing a lot of wilderness here: fields with shoulder-high weeds, impenetrable thickets of trees that have not been touched for 50 years, ropes of poison ivy as thick as boa constrictors, stumps hidden in weed clumps that stop a mower cold. I tell Jill that, once we have the land under control, it will all be manageable. But nothing’s under control yet. And still we’re living out of boxes. 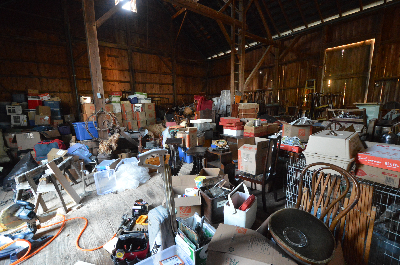 Every day we make forays into the barn to dig out whatever we can find. And every day there’s too much we can’t find. 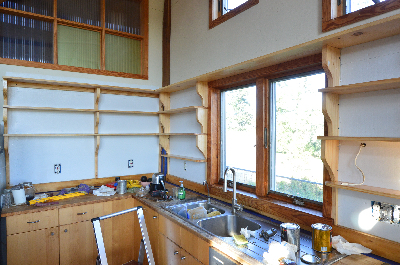 To give us a little touch of stability, I took time out to build some shelves for the barn apartment. I could spend weeks outfitting this apartment with cabinets and shelving. But right now the land is our priority. 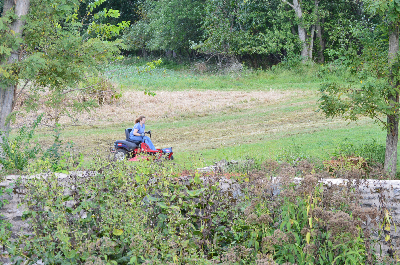 Girl tearing around on her mower in the back field. 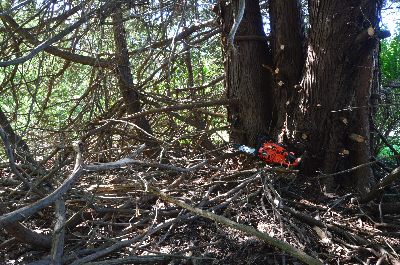 I’ve spent a lot of time with my chainsaw this week, clearing a path through brush and trees to make room for our fence. 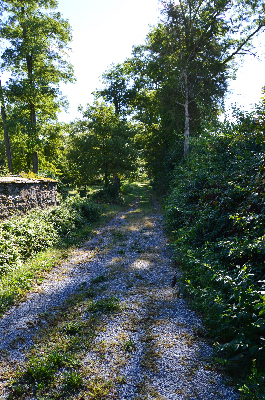 Cutting isn’t the big chore; it’s the clearing that’s a pain: dragging all of those limbs, weeds, and vines into piles. I estimate that we’ll need at least five 30-yard Dumpsters for yard waste alone. A 30-yard Dumpster is the size of a train car. After trying out two other guys who wanted a raise after their first day of work, even though they weren’t working hard and had no skills to offer, I had the pleasure of meeting Omar. He has a full-time job and five children. But he’s willing to work weekends; he works hard; and he knows how to operate a weed whacker, among other things. So I gave him an immediate raise ($12 an hour). If he stays on, I’ll give him more. Mowing the west field, I came across a fox hole, which nearly tipped over my tractor. The problem is, soon the farm will be fenced in — and we don’t want to make a pet out of the fox. A fox will eat a cat, not to mention chickens. Today I called a trapper to relocate the ground hogs. Cute as they are, ground hogs are a hazard. You can break your leg if you happen to step into their large holes, which are often concealed in high grass. Or, worse, you can tip over your tractor. Ground hogs happily riddle your barn floor with huge holes. They’ve done this to our stable, and it’s going to take a lot of work to fill those holes and resurface the dirt floor. What I’ve learned so far is that farm work is enjoyable . . . as long as your machines are working. Every machine we own is old (obtained at auctions) and already we’re encountering mechanical mishaps, like a sticky starter, a recurrent dead battery, a wonky fuel injector, etc. Some machines (like the push mower) I haven’t got to work yet. I’m amassing all kinds of supplies to nurse the machines: a big battery charger, an air compressor (fill those tires), various fuels and potions, an assortment of spark plugs, etc. This is what farm life does to you: to be self-sufficient you’ve got to have lots of supplies, equipment, and back-ups. Side note: as I write this entry, a night hawk is calling from the back field. It sounds like the sudden creak of a rusty gate. Jill says, “They no longer sell clothes pins and cheese cloth at the grocery store. That shows you how old I’m getting.” We need clothes pins for the laundry line behind the house. It’s been in place for at least 50 years. 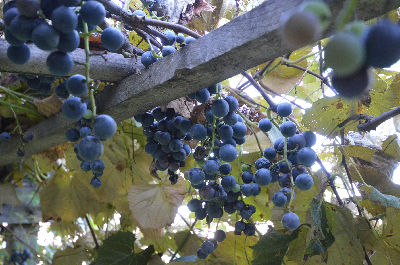 The cheese cloth is for straining grape juice. 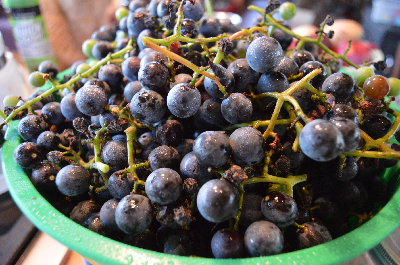 Our 100-year-old grape arbor produced a surprising amount of fruit, so Jill made juice. It took her half a day. But it’s really good juice. Little surprises like this pop up every other day: moving to the country made my car insurance drop from $180 to $51 a month. Previously, Jill and I were living in a neighborhood that had one of the highest car theft rates in Baltimore. We still haven’t gotten our barn cats because we don’t yet have time to deal with them (they have to be sequestered for a couple of weeks before they’re acclimated). The next week of work multiplies our projects to include excavating around the house’s foundation (to dry out the basement), hauling away piles of rotting cut wood, receiving several tons of stone and gravel for a drainage and a patio, grinding out 20 or more stumps, clearing more weeds, and so on. We’re racing to get as much as possible done before winter. So, the to-do list is always going to be greater than our time, energy, or resources. But you’ve got to aim high. And you can’t let up.